Six months at sea! Yes, reader, as I live, six months out of sight of land; cruising after the sperm-whale beneath the scorching sun of the Line, tossed on the billows of the wide-rolling Pacific — the sky above, the sea round, and nothing else! Last month, after exiting the Matisse exhibition, from across Fifth Avenue yours truly spotted one of the Met’s kiosks. The words Marquesas Islands leapt out at me. I turned right around. Apparently there was an exhibition called “Adorning the World: Art of the Marquesas Islands” (to January 29, 2006). I nearly walked right past it. If it hadn’t been for the photo blow-up of one of the islands I would have ended up in Mexico, after having passed the South Pacific in general. How fitting it would be to include Marquesan art as a follow-up to Matisse and my discovery that he was influenced by Tahitian tifaifai or appliqué. One suspects Matisse was in Tahiti in 1930 because of Gauguin. I would bet he had read Gauguin’s Noa Noa. And then there is Gauguin to consider. There may be a tacky little Gauguin museum on Tahiti, but Hiva Oa is where my half-Peruvian Uncle Paul passed on. Fed up with the intolerant ways of overcivilized Tahiti — Paul was a big drinker and seemed to make a habit of pestering everyone — he ended up 800 miles away on Hiva Oa in the Marquesas. He still had to battle the local priest. Ah, The Marquesas. Herman Melville, Robert Lewis Stevenson, and Jack London — all had touched those shores, those craggy, ever-so-isolated isles. And written about them. All are great-great-uncles of mine. Unlike our biological families, we can construct our art and literature families. The first evening I walked by the Marquesas steamship waiting room on the Papeete harbor, I saw an elderly lady, frail and exhausted. She was the only one there. The next morning she was still alone, sitting patiently with her hands folded, wearing her ankle-length rayon dress, dark blue with tiny flowers, in the overwhelming damp heat. I wish I had stopped to talk to her. Perhaps she needed help. A hundred years earlier she could have been a missionary or a school teacher; her demeanor was such. Did she live on Hiva Oa, having come back to Tahiti to meet someone or to take care of some business? Why was she staying overnight without any luggage in a waiting room? Had she been robbed? Did such things happen in humid, carefree Papeete? Was she trying to track down an errant son…or daughter? 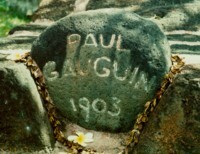 But maybe this was going to be her first trip to Gauguin’s grave; she was a high school art teacher who had saved up for years so that after her retirement she could make her dream trip to Gauguin’s grave. Gauguin was her adopted great-great-uncle too. Perhaps she too was going to Hiva Oa to die. The photo in the Met exhibition makes the Marquesas look more like Tahiti than Tahiti, more like the Tahiti of your dreams — with those spiky, rocky peaks right out of Hollywood’s Mutiny on the Bounty. Was it Hiva Oa where my great-great-uncle Herman jumped ship, hung out with cannibals and lived to tell the tale in his first and only commercially successful book Typee? No, it was Nuka Hiva. On the islands, there are coves at the mouths of gullies running down the slopes of the peaks of the extinct and largely submerged volcanoes, peaks and chunks of lava that make up the Marquesas far away in the lonely Pacific. Crossing the uplands in Melville’s time was difficult, as was boating from cove to cove, since there are no coral reefs to soften rough seas. Tribes in each distinct gully fought one another, took hostages and sometimes ate them. Tattoos, among other things, celebrated battles, and human skulls were sported as part of warrior regalia. I don’t go along with the current anthropological belief that cannibalism is simply a way to get protein. My vegetarian friends have convinced me that you can get by quite well without animal — or human — protein. My theory is that cannibalism is about showing contempt for your enemies; they are not human. They are just animals for your dinner. Christianity ended all of that. 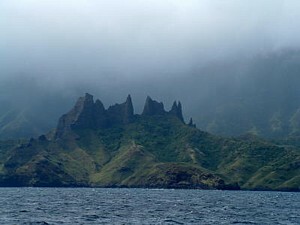 Not only are the Marquesas isolated in the far Pacific, they are isolated from each other. These days, it is still so difficult to get from island to island that whenever modern Marquesans decide they need to have an inter-island conference, they fly to Tahiti. But who can resist the romance of the South Pacific? Just pronounce the names of the inhabited islands of the Marquesas: Nuku Hiva, Ua Huka, Ua Pou, Hiva Oa, Tahuata, and Fatu Hiva. And 800 miles from Tahiti! One source says there were 18,000 Marquesans in 1842; 5,264, in 1887; 2,096 in 1926. That’s the cost of civilization, Euro-style. Now there are 7,500 or so on the six islands, so things are looking up. Or getting less civilized. Of course, all of these islands are doomed as the ocean level rises, inch by inch. Perhaps I was jet-lagging, but sitting at a bar in my hotel on Moorea — or was it Fiji? — I think I heard another American trying to explain to the locals that Dutchlike dikes and sea walls were in order. Why did they look at him as if he were from Mars? Tahitian had protested French atom-bomb tests in the South Pacific, but how do you protest global warming? Wilhem Gottlieb Tilesius von Tilenau, An Inhabitant of Nukahiwa (Marquesas), 1813. The Marquesans are famous for other things than being nice to Gauguin and scaring and seducing Melville. Because, as you may have noted, we are now going to have our fresh fruit tattooed rather than stickered (progress! ), Marquesan art has a peculiar relevance to modern living. Marquesan tattooing, whether ancient or contemporary, is widely thought of as the best in the world. You may have also noticed that everyone on your block or at your gym below the age of 95 has tattooing of one sort or another. I live in Manhattan, in the East Village, a few blocks from St. Marks Place. Between The Bowery and 2nd Avenue on St. Marks, I counted five tattoo parlors. Since it’s summer, everywhere I look I see tattoos on the tourists, teenage punks, bikers, poets, rockers, bums, socialites and runaways. I have no tattoos. I can never quite decide what kind of tattoo I want. An armband? A picture of Herman Melville? A shirt made up of tattooed barbed wire? Besides, I don’t like pain. My beloved has a small tattoo that looks like it was handmade in prison (it wasn’t). I know of a famous museum director, now retired, who has full-body tattooing. It started, or so the theory goes, because fresh out of high school (where I knew her) she acquired a biker boyfriend. Or another theory: she wanted to break the bonds of her Jewish family, since tattooing precludes one from ever being buried in an Orthodox cemetery. Tattoos are no longer taboo. Although preservation is a problem, tattoos are art. One wonders what Melville thought of the tattoos on those “ancient, decrepit and worn-out sailors” taken care of, more or less, at Sailers’ Snug Harbor in Staten Island. He sometimes celebrated Christmas there with his brother Thomas, who was president of this great charitable institution. Sailors’ Snug Harbor is now Snug Harbor Cultural Center, where yours truly was director of visual arts. My office was in the 1831, neoclassical Main Hall; it had once been Thomas Melville’s. The stained-glass window above the entrance to the Main Hall still sports the motto concerning ancient sailors. Many times our sailors (some of them already decrepit at 30) tired to destroy this offending blurb. And sometimes, in their cups, they succeeded. But we do learn from Herman Melville’s Typee, if nothing else, that Marquesan tattooing was as much about process or ritual as anything else. He chose a young man to describe rather than an older, less buff bloke because the tattooing continued throughout life, designs and symbols superimposed, resulting in an illegible “garment” of tattooing. Whereas Marnoo’s tattoos were crisp. When one can visit Marquesan blogs and websites, when tattoos are as common as T-shirts and “the other” is no longer the other (having retreated to the romantic past or deep inside, where it always was), what would be the point of actually going to Hiva Oa? To see a reproduction of Gauguin’s hut, The House of Pleasure? To see where tikis came from and where tourist tikis are carved? The tiki (or carved, bug-eyed figures in wood or stone) have, thanks to Trader Vic’s, become synonymous with things Polynesian. I myself might like to see a giant stone tiki in situ. But, if the truth be known, all or most all of the islands’ pre-Christian, pre-Western art is gone: it is in Western museums. 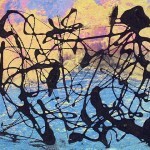 We can now see a fair sampling at the Metropolitan Museum of Art. It is rare stuff, and this is the first museum show devoted to Marquesan art, 74 items in all. 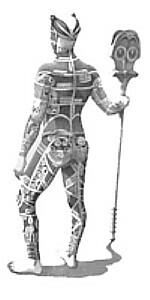 Here you can see Western watercolors documenting the full-flowering of the tattoo; ear ornaments of human bone; staffs and pipes; a phallic poi-poi pounder collected by Gauguin. Fans, headdresses. And although you cannot see the wooden “tattooed” arm collected by Robert Louis Stevenson pictured in the catalog, you can see two wooden legs similarly inscribed. Were they made for Western visitors? Were they table legs? No one knows. We are not sure exactly how ornamenting/adorning (every surface in sight, it is claimed) the Marquesans actually were before contact. The tourist trade started early and most likely accelerating the ornamental urge. What is real? Rather, what was real? We now know Melville’s Typee was in part fiction, although sold as fact.. He lived among the Taiohae for four weeks, not four months. There is no inland lake on Nuka Hiva. And consequently the lovely Fayaway, if she existed at all, could never have parted and lifted her tappa robe to make a sail for Melville and his sidekick Kory-Kory in their canoe. Did Fayaway really have blue eyes? Melville must have seen at least one woman with such, for otherwise it is just too strange. Was Marnoo, he of the elaborately described and celebrated tattoos, really a Polynesian Apollo? It doesn’t matter. Fayaway and Marnoo live on. Are the Marquesas still remote? Still beyond the beyond, as it were? 1. Once I was lucky enough to attend a small art conference on the Micronesian island of Phonpei (formerly Ponape). We stayed in posh digs built for rich scuba divers: all the huts overlooked a dream lagoon. Each hut had a water bed. This was 1980. And the steaks and produce for the nightly sit-down dinners were flown in by jet. The proprietors, a handsome American couple with two children, had started out in Hawaii but found Maui too developed for their tastes. Although you could still wade in a lagoon whose bottom was covered with sea cucumbers, and even as we chatted some angry Ponopeans, armed with machetes, had taken over the control tower of the airport, the chef, also from Maui, was getting restless again and wanted to move even further away from civilization. In a few days, he would be off to Truk. 2. I know an artist who every year meets up with a handful of buddies. Without wives or girlfriends, each year they go trekking further and further north. Once they were stranded somewhere in Lapland and were reduced to eating boiled lichen. Rescued by helicopter, that very evening they sat down to dinner in a four-star restaurant. I thought I would go further than my predecessors in Western literature, not farther North (like Rockwell Kent) or farther South (like Admiral Byrd), but further out. Not only would I steal from sources of dubious accuracy, I would not go to the Marquesas at all. I would lie. The Marquesas of the imagination are undoubtedly much better than the Marquesas of mere facts and figures, sweat and sand flies.